Have a golfer in your life? Give the golfer in your life a gift card for our upcoming golf leagues! The leagues begin the first week in January and are fun, affordable with flexible play times. Get all the scoop by clicking here. It was great to get out with the boys and play once a week. The courses were fabulous and the food and drinks by Shots & Slices was great – loved the pizza. – N.W. Great value for the price. The banquet was a blast, so much food, fun and great prizes.- M.G. Playing the last two leagues at Silver Tee really helped my golf game. – E.S. The league was a much needed, once weekly, ‘Girls Night Out’. Sometimes a few non-league friends joined us and we even met some other ladies who golf. – K.P. Christmas gift cards are available in any amount for everything at Silver Tee! Please call 519-966-4911 for more information. 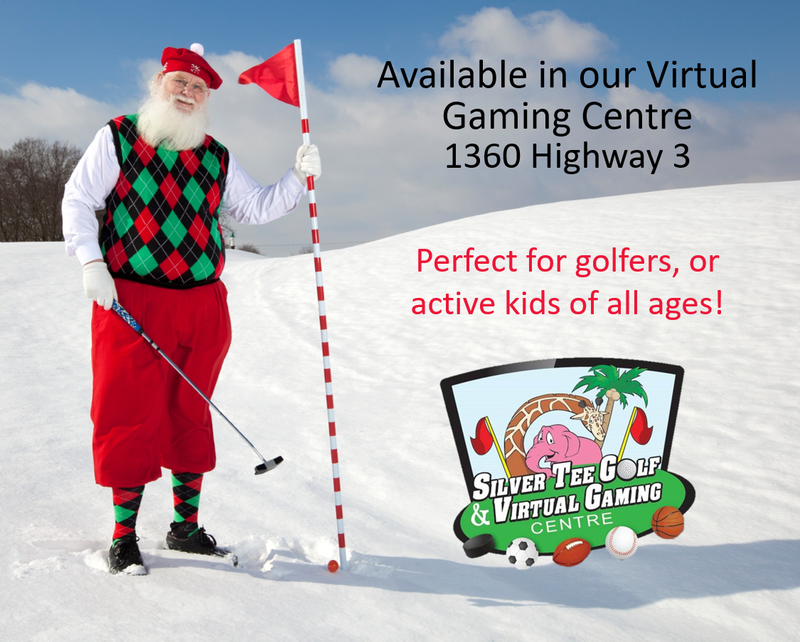 We’re open daily at 10 (please come to the Virtual Gaming Centre) – pop in and get your Christmas shopping underway! Christmas Gift Cards Now Available! Pop in and pick up yours today. We’re located at 1360 Highway 3 between Walker Road and the 401 roundabout. We’re open daily from 10am until Midnight. Year after year, we’re so happy to be a part of Father’s Day celebrations in Windsor and Essex County! Whether your dad is a golfer or just loves to spend quality time with the family, we have a fantastic Father’s Day planned! Simply visit our pro-shop and purchase any sized basket of range balls. Hit the range or grass tees and one of our golf pros will be around to offer you free golf tips, customized to your golf game. Mini golf, driving range, virtual games and sports: We have your family fun covered – proceeds to benefit For The Love of Paws Pet Rescue. Meet adoptable dogs – leashed pets also welcomed on Father’s Day! Yes! Gift cards are available for driving range memberships, indoor golf, indoor golf leagues, merchandise and gold lessons. Our pro-shop is open daily at 9am. Sunday, June 19th… It’s a Father’s Day tradition – family time at Silver Tee! …Or maybe Dad would like a few hours to himself… it’s the perfect time to hit the driving range and relax with a drink on the Shots & Slices patio! Plus we have ‘Free Tips from the Golf Pros’ happening from 11am – 4pm. Simply purchase a basket of balls, hit the driving range, and a golf pro will be around to offer you free advice! Father’s Day is also our annual ‘Putt Putt for Pooches’ Fundraiser and Adopt-a-thon; to benefit ‘For The Love of Paws’ Animal Rescue. 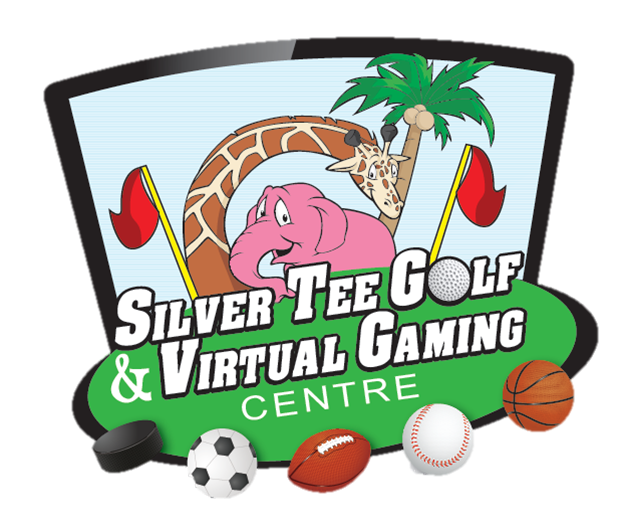 Just by enjoying yourself at Silver Tee, you’ll be helping raise money for abused, neglected and abandoned pets right here in Windsor and Essex County! Need a gift for Dad? 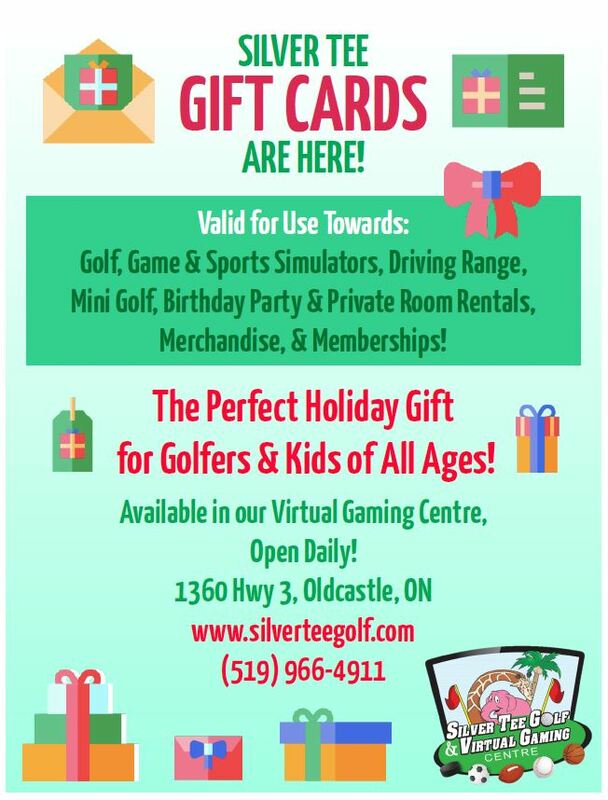 We also have gift cards available, which can be used be used for the driving range, indoor golf, golf lessons, golf leagues and merchandise. See you Father’s Day at Silver Tee! Give the gift of quality family fun! Christmas gift cards are available in all denominations for our game and sport simulators. What a great way to enjoy family time together! Our multiple gift certificate options are also perfect for the golfer in your life!